Still using a dumbbell, stand upright holding a dumbbell in each hand. Hold the dumbbells in a hammer position (from the name), with your arm bent to your shoulder and two ends of the dumbbell pointed upwards and downwards. Now, slowly bend your arm downwards to your side and then bring it back up to your shoulder. Repeat these steps at least 10 times. One of my favorites as it requires no equipment and can be done almost anywhere. This exercise not only tones your arms but strengthens your chest, abs and buttocks. Lie on the floor in a plank position and place your hands closer than shoulder width for a close hand position and make sure you are holding your torso up at arms’ length. Now, lower yourself towards the floor until your chest is about to touch it (inhale at this position), then press your upper body back up to the starting position (breath out as you perform this step). Repeat movement 10 times. Dumbbells again! This exercise works the rear deltoids and improves the appearance of both the arms and upper back. 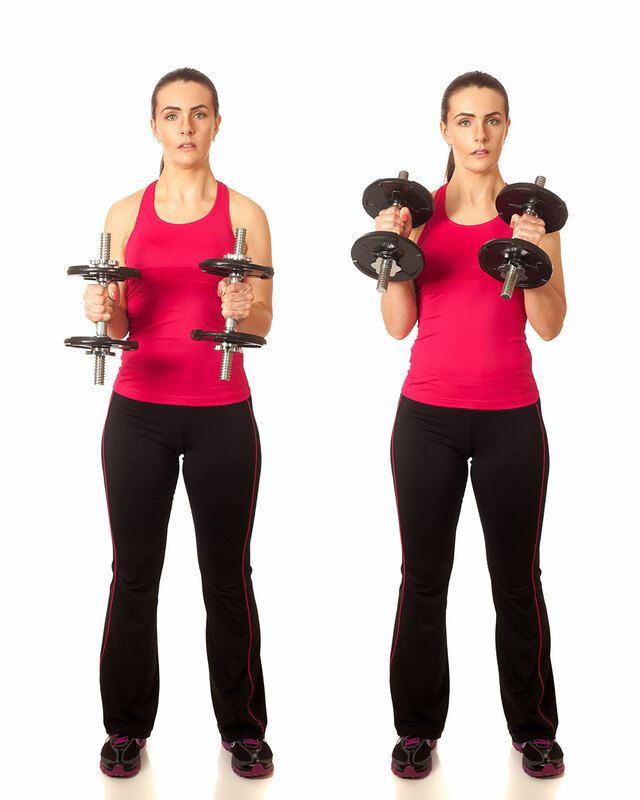 Get two dumbbells in each hand by your side at arm’s length while standing with a straight torso. While maintaining the torso in a stationary position, lift the dumbbells to your side with a slight bend on the elbow and the hands slightly tilted forward, and go up until arms become parallel to the floor (exhale as this step is performed), and lower the dumbbells back down slowly to the starting position as you inhale. Repeat movement 10 times. Pushups are great for toning your chest, shoulders and arms, reason why I sometimes refer to it as “all in one” exercise. Lie on your stomach, and use your arms to push yourself up onto your toes. Then slowly lower yourself towards the floor so that your arms are at a 90 degree angle. For better results, repeat steps at least 10 times.